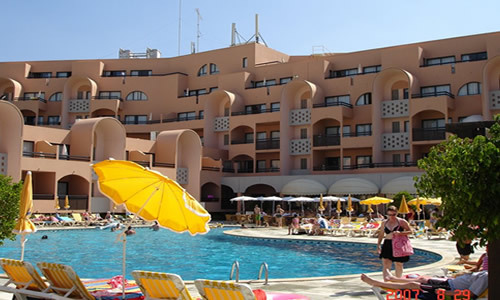 Centrally located, adjacent to the lively town of Albufeira and a short walk from the golden beaches of Praia da Oura beachfront, the Ouro Praia Aparthotel is a comfortable and friendly resort on the Algarve. The hotel is part of the group that includes Clube Praia da Oura and the Oura View Beach Club, and all guests may make use of the amenities at the three stunning resorts. A holiday on the Algarve is all about the beach, the sun, sea and magnificent surf of the glistening Atlantic Ocean. The Oura Praia Aparthotel is well appointed and offers a selection of studio, one and two bedroom apartments. All units at the resorts are spacious, immaculate and have all of the modern conveniences like satellite television, air-con, and a full kitchen. The two bedroom apartments sleep up to six adults comfortably and it's a great resort for a group holiday. Each apartment has a fully furnished patio or balcony with views over the central swimming pool and Oura Village. Albufeira is a major tourist attraction on the Algarve and if you're out and about for the day you must make a trip to the ‘Old Town'. It's a bustling, traditional market and you'll be able to pick up some excellent bargains to take back home. If you have little ones then you should make a day of it and experience one of the three water parks in the area: Aqualand, Slide and Splash and the ever popular Aqua Show are great entertainment and fun for the whole family. Zoomarine is an exciting attraction and a fantastic way to experience the rich and abundant marine life of the Algarve waters. If you want explore further afield, hire a car and head for the hills. The Algarve has some of the most dramatic coastline in the world, and you'll get the opportunity to experience the immense history and culture of the region as you pass through Lagos, Tavira, Vilamoura and the historic town of Portimão.